The St John’s Chapel forms the foundation of the College and is a place of worship for the College community. 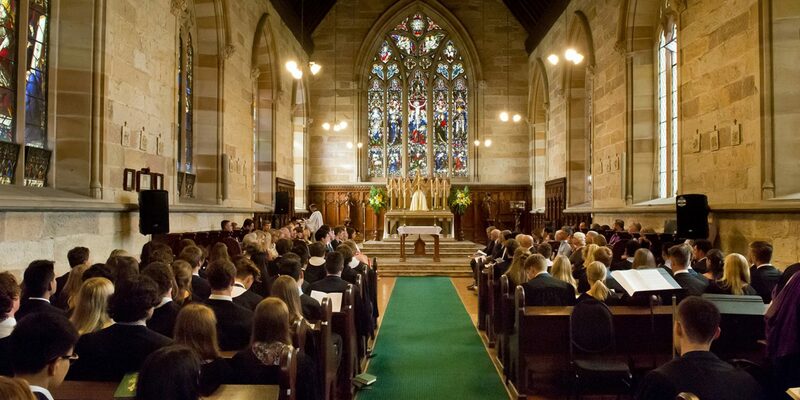 As the oldest Catholic College in Australia, the Chapel brings everyone together – including current students and their families, alumni and their families, and staff – to reflect on what is most important. Mass is held in the Chapel on Sundays at 5:30pm during terms. Parents are very welcome to also attend Mass at the College. A special tradition at St John’s is singing the Salve Regina after Mass as the congregation processes out of the Chapel and into the Lady Chapel. This is an ancient hymn in honour of Mary, the Mother of God. The Chapel is unusually located on the first floor as per the original designs of William Wilkinson Wardell (1823-1899). He designated that the Chapel be situated on “the principal floor and there shall be no rooms above it” which in this case was the first floor or ‘piano nobile’ level, containing the Dining Hall, Library and Brennan Hall. It was completed in 1863 as part of the northern wing and longitudinal arm of the College by Edmund Blacket (1817-1883) the colonial architect appointed to supervise the construction of St John’s College. The fine interior decoration and craftsmanship of the Chapel was achieved over many years. Most of the sanctuary furnishings were designed by Edmund Blacket in the 1860’s. The Blessed Sacrament Shrine is made of Bondi gold sandstone with a Paddington grey tabernacle and was carved in Australia. The pillars supporting the altar are English marble with English stone capitals. The elaborately carved oak Sanctuary lamp is very ornate with acorn and vine leaf laureling about the pedestal. The original cedar choir stalls and pews are located in the Chapel and surrounding areas. The chapel wrought iron gates and grilles were designed by Wardell and Denning and installed between 1915 -1921. The completed design features of the gates include the motif of an eagle, the symbol of the evangelist and the college motto ‘Nisi Dominus Frustra’. They were presented to the College by Mrs N. A. Daley. The Chapel contains several beautiful stained-glass windows. The original designs were commissioned from John Hardman and Co of Birmingham in 1918 and were paid for by donations of generous benefactors. Hardman designed a scheme for the 10 side windows of the chapel but only 3 on the northern (left) side were completed. The designs were based on the writings of St Bonaventure as quoted by Cardinal Newman in “Discourses of the scope and nature of University Education” and were conceived as an intellectual journey through the four kinds of light that comprise the Divine light. In the first window Christ is presented as the Light of the World. In the second and third, the knowledge of material things is signified by St Virgilius reflecting on the possibility of a great southern land and the Abbot Mendel studying in his garden. Another two stained-glass windows have been added to the Chapel, donated by John Flood Nagle, one of Australia’s greatest jurists. Both windows depict scenes featuring two notable figures of Catholic history. Thomas More, humanist scholar, lawyer and statesman, was born in 1478 in London, studied at Oxford and Lincoln’s Inn, and was called to the Bar in 1502. He entered parliament in 1504 and from 1514 was engaged in royal service, becoming a secretary and adviser to King Henry VIII. More’s most famous work, Utopia, was published in 1516. His complete works run to 15 volumes in the scholarly edition published by Yale University Press. In 1527 the King petitioned Pope Clement VII for an annulment of his marriage to Catherine of Aragon: the lack of success in this endeavor caused the dismissal of the Lord Chancellor, Cardinal Wolsey. More succeeded Wolsey as Chancellor in 1529, the first layman to hold the office. More however opposed Henry’s policies in relation to the annulment and the looming breach with Rome and surrendered the chancellorship in 1532. The Act of Supremacy of 1534 declared that the king was the "Only Head of the Church of England on Earth so far as the Law of God allows" and the Treasons Act made it treason to deny that the king had the dignity declared by the Supremacy Act. In 1534 More refused to swear an oath acknowledging the royal supremacy and he was imprisoned in the Tower of London. On 1 July 1535 he was tried for high treason and convicted in what would today be called a “show trial”. He was executed on 6 July 1535. Sir Thomas More was beatified by Pope Leo XIII in 1886 and canonized as a martyr by Pope Pius XI in 1935. Pope John Paul II declared him the patron saint of statesmen and politicians in 2000. In 1980 the Church of England recognised St Thomas More as a Reformation Martyr. The window in the St John’s Chapel was donated by John Flood Nagle in 1993 in memory of his brother, Valentine Flood Nagle, killed in action in New Guinea in 1943. John Henry Newman was born in London in 1801. He was an undergraduate at Trinity College Oxford, but examination anxiety caused poor performance in his finals for the BA in 1820. Nevertheless he subsequently obtained a fellowship at Oriel College in 1822 awarded on the basis of a separate examination. In 1825 he was ordained as a priest in the Church of England and in 1828 he was appointed vicar of the University Church of St Mary the Virgin in Oxford, an appointment which was (and still is) in the gift of Oriel College. From 1833 Newman began an intense examination of the claims of Anglicanism especially in light of the development of Christian doctrine in the early church, work undertaken with other scholarly churchmen in what became known as the Oxford Movement. This journey led him to being received into the Catholic Church in 1845, a decision with large personal consequences for a public figure at that time. He was ordained a Catholic priest in Rome in 1846. In 1848 Newman founded the Birmingham Oratory, a community of clergy on the model established by St Philip Neri in Rome in 1575. He lived in Birmingham for the rest of his life except for the years 1854 to 1861 when he was the first rector of the Catholic University of Ireland (now University College Dublin). Newman was created a cardinal by Pope Leo XIII in 1879. He died in 1890. Cardinal Newman was beatified by Pope Benedict XVI in Birmingham in 2008. Newman had a vast output, including landmark theological works, controversial and apologetic writings, sermons and lectures, poetry, hymns and a novel. The works published during his lifetime run to 41 volumes in a uniform edition. His letters and diaries have been published in a further 32 volumes by Oxford University Press. John Flood Nagle left a bequest for a window depicting Cardinal Newman “with an allusion to his theology on the Freedom of the Individual Conscience as expressed in his letter to the Duke of Norfolk published in 1875”. The window was made by the artist Christopher John and dedicated in 2016.